The retaliatory attack by Pakistan’s F-16 was the most botched up operation. In short, both the attack and our defence pointed to the valour and professionalism of our Air Force. Pakistan was globally isolated. Even the OIC refused to pay heed to it. It violated every tenet of the Geneva Convention in relation to our brave Wing Commander Abhinandan. Not only was Pakistan globally isolated, the issue of its terrorism has reached the Security Council. So helpless was the situation that it was in no position to even admit the attack at Balakot. If it had admitted the attack and its consequences, the evidence of a terrorist camp in existence and the list of dead terrorists would have been international issue. The whole of India was speaking in one voice. Public opinion overwhelmingly supported the Government’s decision and the Air Force’s execution. However, like its other friends in the Opposition, the Congress Party refuses to learn. After initial show of support for our Air Force, it tried to create a divide in India’s political opinion. From the Congress and its friends, we have witnessed three recent statements. In a meeting of the 21 Opposition Parties, a resolution was passed, accusing the Prime Minister of politicizing the Pulwama and Balakot incidents. The Government had twice taken the Leaders of Opposition parties into confidence. No evidence of politicization was given. The statement was inappropriate. It gave a handle to the enemy. The media in Pakistan used this statement of 21 Opposition Parties as a trump card. 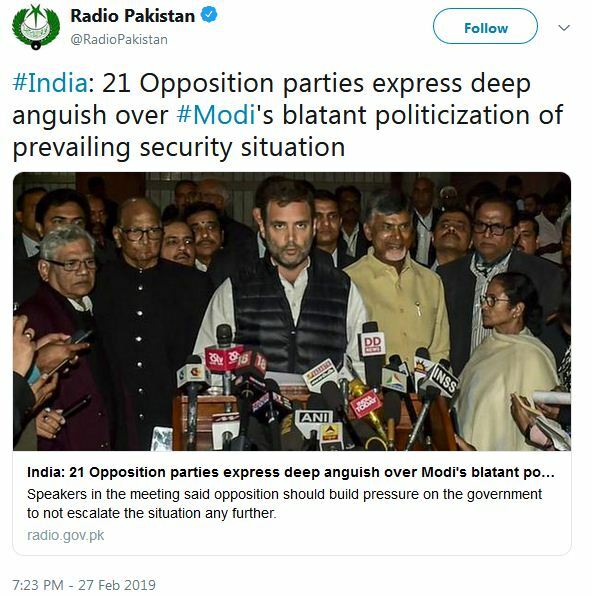 It took the statement as an endorsement of the Pakistani position that India had taken the Balakot action because of the compulsion of its domestic politics and not as a part of it’s policy to defend the country against terrorism. The West Bengal Chief Minister went a step further. She started doubting the veracity of the incident and wanted to know the operational details. The credibility of both the Government and our Air Force is being doubted. Even Congress leaders have raised similar questions. (i) The former Prime Minister elevated himself to the status of a neutral third party rather than be concerned about India’s interest. (ii) He further developed a theory of parity and equivalence between both India and Pakistan. The perpetrator of terrorism and the victim of terrorism are both at par according to him. (iii) Implicitly, he doubts India’s right to defend its sovereignty from those who want to damage it through terrorism. (iv) There is no condemnation of terrorism in that speech. (v) Amongst the problems facing India that he mentions which include poverty, ignorance and disease. Violence and terrorism are of no consequence in his assessment. Seen collectively and cumulatively, the above three statements ought not to have been made. They hurt India’s national interest. Not only do they give smiles to Pakistan, they become an important instrument in Pakistan’s hands to discredit India. Does the opposition want the Air Force to release operation details of the Balakot attack? The Opposition is entitled to oppose and ask questions, but then restrain and statesmanship are also an essential ingredient of public discourse. I hope, India’s Opposition revisits its position and does not let down the nation.